Once again from UAF Summer Sessions, Concert in the Garden performance by Susan Grace, Alaskan troubadour, singer and songwriter. Her songs analyzing the effect humans have on the planet were made more poignant by the smoke blowing in from a nearby wildfire. It wasn’t enough to deter people from enjoying the music. The concert took place June 17, 2013 at the Georgeson Botanical Gardens. Sun rays streak through smoke. Flags fly at UAF’s Georgeson Botanical Garden. Concert in the Garden was a fantastic event to photograph. So much is happening in a very compact area, allowing for photographs with many different elements. Work for some, play for others. People gladly support the gardens during the free concerts. Can’t have a post about music without the standard close up of the musician! Susan Grace taps her guitar and sings, June 27, 2013. Concert In the Garden: Will Putnam and Trudy Heffernen. I recently took a short, part-time job for UAF Summer Sessions photographing classes and events. Included in those events was concert in the garden, a weekly, outdoor concert held in UAF’s Georgeson Botanical Gardens. The lovely settings, typically great weather and lively music drew large, energetic crowds. On June 20, 2013, Will Putnam and Trudy Heffernen delighted the audience with their country-bluegrass rock. Alaska Railroad trains may make music harder to hear, but add fun picture elements. Always working: Josh Bennett, of Sound Reinforcement Systems, mixes the music. Roses in the foreground, musicians in the background. I’ve said it before, I’ll say it again: raw files are superior to jpeg. It is rather disappointing to be photographing and realize the camera is only recoding jpegs. That is what happened during this shoot. Enough on that. Perhaps best known for his weekly Pianno Puzzlers segment on NPR’s Performance Today, Bruce Adolphe recently played in Fairbanks. Piano Puzzlers, as his website describe, “…Adolphe at the piano, playing folk tunes and popular songs in the styles of famous Classical composers,” was played with live contestants in the studio for the first time ever on Alaska Live, at KUAC. All three contestants got the answers right, check out the puzzlers, fun conversations, and great piano playing in a series of two podcasts. Bruce Adolphe, host of Piano Puzzler, warms up before playing for conetestants. Bruce Adolphe plays a Piano Puzzler for contestant April Jaillet. Left to right: Maryanne Babij, April Jaillet, Jeff Iverson, Bruce Adolphe and host Lori Neufeld. Any regular followers may have noticed a lack of posts the last seven days. It was my final week of undergrad, and wanted to make sure I finished everything I needed to graduate. Now that school’s over, it’s time to get back in the postings. Today will be a brief post of my favorite local band, Steve Brown and the Bailers, who were recently featured in UAF’s bi-yearly publication Aurora. The Spring 2013 printing also features a good article about the state of journalism in Alaska, a fun info sheet about the Equinox Marathon, and a two-page spread with my photo of UAF’s Research Vessel Sikuliaq. The article about Steve Brown and the Bailers highlights their national successes, and offers a little insight into how their name came about. Hint: it had to do with unreliable band members. The following photos are from a performance they gave July 28, 2012, at the uniquely-Alaskan Howling Dog Saloon. Photographically, one of the best things about the Howling Dog is the plethora of memorabilia plastered on walls. Low-flying planes be damned, this band will play on. Enthusiastic dancers always enjoy the Bailers. Guest artist Caitlin Warbelow, left, joined a few songs with some impressively-frantic fiddle. A long-while back I posted a few images from Mountain Stage, when, “Live performance radio from the mountain state of West Virginia,” visited UAF. I also did a feature story for my student paper, The Sun Star. Here’s another selection of photographs in black & white, which is commonly referred to as monochromatic. Though monochromatic means one shade of color, such as varying hues of red, it expanded to include images in black & white. Tim Easton, center, plays at the Davis Concert Hall, accompanied by Megan Palmer and Kliff Hopson for NPR’s production of Mountain Stage. Tim Easton, accompanied by Megan Palmer. Pat Fitzgerald and Robin Dale Ford, accompanied by the Mountain Stage band, play at the Davis Concert Hall. August 17th, 2012. Backstage Davis Concert Hall for West Virginia Public Broadcasting’s Mountain Stage. And the single color image for today. Music Monday: Eel House and St. Animal. I had few gigs to juggle Saturday, April 20, 2013. I had a brief, but necessary, walk on part in The Firebird at 2 p.m. and 8 p.m. Between those was load-in and sound check for St. Animal, headliner at The Pub that night. After sound check a brief trip over to KUAC’s studio to help out with Alaska Live, feature Eel House. Immediately after the second performance of Firebird it was back to The Pub to soundcheck the opening band and start the show. Eel House is a four-piece with vocals, their music is a mix of contra dance, bluegrass and indie-rock. I didn’t have to time to stick around and get all their names. Keys, drums and vocals comprise part of Eel House, who performed on Alaska Live with Lori Neufeld. Bass and fiddle make up the two-remaining members of Eel House. St. Animal has six members who at any point in time play a variation of drums, bass, electric guitar, mandolin, fiddle, banjo, trumpet or trombone. St. Animals plays an energetic set at UAF’s Pub, Saturday April 20, 2013. Please excuse my lack of posts in the previous week, I had been traveling with limited use to internet. Jumping back into posts today with a brief Music Monday. Clinton Fearon, Jamaican Reggae artist, played a solo show on Alaska Live with Lori Neufeld March 8, 2013. Check out his podcast on KUAC’s website. There was a shortage of light during this particular shoot, so even at ISO 3200 my shutter speed was a somewhat testy 1/25th of a second. Thanks to a steady hand and image stabilization I was able to get a few sharp shots. One cool effect of a slow shutter is the blurring of Clinton’s strumming hand. 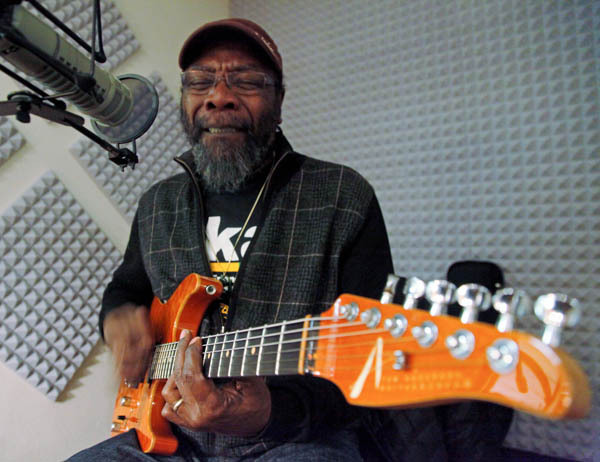 Clinton Fearon uses music to spread his message of hope and love on Alaska Live, with Lori Neufeld. Welcome back to the second installment of Music Monday, on Far North Light. Twice a year, in summer and winter, The Fairbanks Folk Festival offers a chance for some of the many Interior Alaska bands a place to conjoin and perform. February 9th, at Pioneer Park’s Civic Center, over 30 acts took turns filling 15- and 20-minute sets. Performances ran the gamut from solo singer-songwriters and a comedian to picking sessions with dozens of stringed instruments. I was there finalizing recordings for my internship at KUAC, which allowed me some time to photograph as well. Check out “The Best of the Fest” podcast on KUAC’s website, where you will also see a slideshow with more pictures that I took. I recommend the recordings that start with Ester Jelly Jam and New Cut Road. Bruno Grunau, of the band Ice Jam, plays mandolin with his 6-week-old daughter Annabelle. Warming up in the green room at Fairbanks Winter Folk Festival. Emcee Lori Neufeld chats with members of Zingaro before they take the stage. Ukulele Russ: One man, one ukulele, lots of hair. In an effort to increase the regularity of posting I will be creating a few themes for Far North Light. Today is the inaugural day of Music Monday, where I feature photos of the various venues and concerts I’m involved with around Fairbanks. Capturing the essence of music in a photograph is no easy task. Obviously the biggest hurdle is lack of auditory signals. What is possible is trying to capture the symbiotic relationship band members share with one another, as well as audience members. Much like a sound wave reflecting off ceilings and walls, energy fills the studio or dance floor, it’s that energy that is possible to photograph. Often to capture the intensity a plethora of obstacles must be navigated. Studio settings don’t offer audience members, or the added energy they bring, to incorporate into the photo. Bright spotlights accompanied with dark surroundings can easily lead to blown out highlights or indiscernible shadows. My technique is expose so no highlights have lost information, then bring back detail in the shadows. Rarely is ISO set below 1600. Another common impediment is a cramped enviornment: instruments, bodies and microphones can easily decapitate an important figure in the background. Thanks to the near unlimited picture taking ability of digital, shoot enough and there’s bound to be good frames. As I mentioned in a previous post I’m doing a professional media internship for KUAC, Public Radio of Alaska. I assist Lori Neufeld in the production room for her show, Alaska Live, a live-music radio program feature Alaskan and visiting artists. The most recent band to play in the studio was The Young Dubliners. This Celtic-Rock band played a mellow version of their stage show. Check out the podcast here. The Young Dubliners perform on Alaska Live in KUAC’s studio at University Alaska Fairbanks.